Students Have Always Been Leaders in the Movement. You Can, Too. Before #BlackLivesMatter, we had the NAACP, the Student Nonviolent Coordinating Committee, the Black Panther Party, and the Congress of Racial Equality — each of which had student activists who led and participated in the Movement. From Freedom Rides to sit-ins to marches to the creation of social programs to boycotts, people your age took action that created actual changes to the law, specifically the Civil Rights Act of 1964, the Voting Rights Act of 1965, and the Fair Housing Act of 1968. Fast forward to the 1-6 and we’re still fighting for freedom that’s all the way 100. Check these strategies used by students back in the day and consider how you can apply them to now. NOW: Start (or join if you already have one in place) a high school or college chapter of the NAACP, and as a group, join movements like We The Protestors, Black Lives Matter, and Campaign Zero. Using the ideas proposed by each group — and ones you come up with on your own — plan monthly events throughout the school year. For example, you could host a Twitter campaign or an e-mail writing campaign demanding that your state’s reps take action to end police violence, you could hold a Saturday teach-in at your school, or you could launch a student newspaper that could cover social justice issues taking place in your school and your community. No matter how small your efforts may seem, they can make an impact. THEN: Fifteen-year-old Claudette Colvin and 18-year-old Mary Louise Smith refused to give up their seats on the bus long before Rosa Parks. However, since they were so young, Civil Rights leaders didn’t think they fit the face of the movement they were looking for. Besides Claudette and Mary’s contributions, numerous other teens, though most have gone unnamed in the history books, joined the Montgomery Bus Boycott. NOW: Actively boycott brands that have been silent on recent events, that have made no acknowledgement about the fact that Black Lives Matter, or that support people or sell products by people who have blatantly racist agendas. Encourage your family and friends to do the same. Instead, spend that money from your after-school job at Black-owned businesses and businesses run by clear allies. Pick up a new tee from Dear Naturalista or Legendary Rootz; cop some new accessories from Rachel Stewart Jewelry; or, pick up a new lip color from Gold Label Cosmetics. Not sure if your favorite brand is an ally? Check #grabyourwallet or the brand’s social media and website to find out. If you see no mention of the recent events, shop somewhere else. Our favorite list of Black-owned businesses? Official Black Wall Street. The key is to mobilize and stand in solidarity with each other for as long as it takes. The Montgomery Bus Boycott had about 40,000 participants — 40,000!! — and lasted for 381 days. According to the 2015 Multicultural Economy Report done by the University of Georgia’s Selig Center for Economic Growth, Black buying power is set to reach $1.4 trillion by 2020. You have the power to make a change — use it. 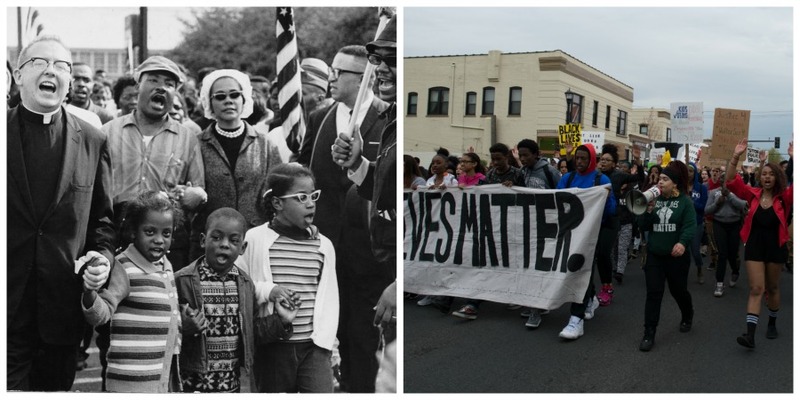 THEN: Scores of people — both Black and white — turned out for marches during the original Civil Rights Movement. From Selma to Montgomery; Washington, D.C.; Chi Town and others, peaceful protesters of all ages marched for voting rights, jobs, fair housing, and freedom in general. These marches, in conjunction with other nonviolent demonstrations, led to changes in legislation. NOW: You can link up with other marchers today, as well. To find out about any going on near you — or to spread the word about any your community may be organizing — head to sites such as BlackLivesMatter.com. Allies all over the globe — from Ireland to South Africa to London to Amsterdam to Germany — have stood with us. There is hope, but we must not be silent, and we must continue the movement so that, for real, a change gon’ come.